While Jesus’ statement makes for a premiere “drop-the-mic” moment, it doesn’t give us much practical advice on how to make that determination. After all, don’t all things belong to God? But the question here is not really about our belongings, but our allegiances, and those are much more difficult to isolate than coins, aren’t they? It is really a question about kingdoms. How can we manage to live in two kingdoms simultaneously while pledging allegiance faithfully only to one? Multiple allegiances complicate your choices. If you don’t understand that, it is probably because you’ve never had to explain to your spouse why you must work late again, or debate over where and with whose family you will spend Christmas, or take the kids to church while your spouse stays home and reads the paper. If you have competing loyalties in your life, choosing can be a real challenge. The religious leaders of Jesus’ day wanted to push him into just such a corner with this cunning question. For the leader of a popular movement, coming down on the side of tax relief would have greatly appealed to his base. After all, there had been a popular uprising with regards to Roman taxation in recent memory; ironically, it was the very tax that had brought Mary and Joseph to Bethlehem—a census. But that stance would have been considered sedition by Rome, ending his ministry. Any politician worth his salt today would have changed the subject. Israel in that period was an occupied country, much like France under the Nazis, and so the question of allegiance was a live one. As with any occupation, people responded in a variety of different ways: some of them were collaborators, some were resistance, but most were simply trying to survive. Undoubtedly, some had begun to worship country in place of God, because they are so easily comingled. We call that practice nationalism. Those religious leaders would have loved to trap Jesus in an allegiance that would stalemate all he was trying to achieve. Multiple allegiances can blind and confuse us when we are called to make tough choices. Why? Because you can’t pledge allegiance to more than one kingdom at a time without one of them taking second place. So we conflate our allegiances—we intermingle them—in order to simplify hard choices. Christians have done this for ages, trying to argue that America is supposed to be a Christian nation, despite information to the contrary in the constitution. And how widespread has been the effort to argue that one political party is more Christian than another, even though both Democratic and Republican parties have positions that correspond with and differ from biblical teaching? (See Pastor Tim Keller’s recent article in the New York Times on this very issue.) Overlapping allegiances confuse the issue. Is there a clarifying question that can delineate our allegiances and make our choices, if not easier, at least more transparent? We must begin by taking careful note of exactly how Jesus responds to their question. He asks them to bring him a denarius, a silver Roman coin, and asks them whose image and what inscription is found on the coin. Much has already been written on this subject, but most likely it contained an image of Tiberius with the inscription, “Tiberius Caesar Augustus Son of Divine Augustus.” It was a coin that was used to pay the Roman poll tax, because it had to be paid in Roman coinage. But Jesus wasn’t trying to make a point about idolatry here; the image gives a clue as to the coin’s purpose. The image on something suggests its purpose. It tells us who that thing or that person is meant to serve. 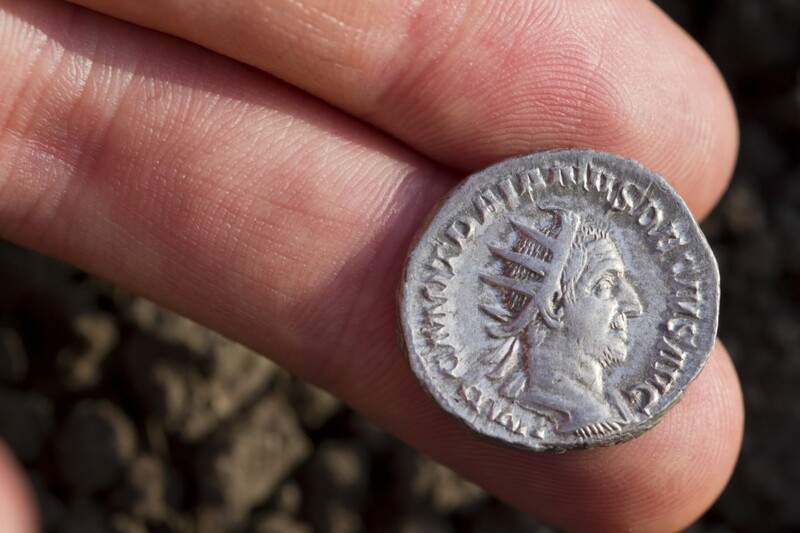 It wasn’t that the denarius actually belonged to Caesar. Clearly, it belonged to someone in the crowd. Instead, Jesus is using the vivid and evocative language of image to ask a pertinent question about identity and purpose. There is a missing question that is only implied in his response: if the image on a coin tells us about its purpose, then what about the image on you? What is your purpose given that you yourselves have the image of God imprinted on you? The image of God is another phrase from the Bible that has entered our shared language, even though we don’t really understand what the author meant. People today will employ it to mean whatever they want, usually an assertion that humans have inherent dignity and should be treated respectfully. But the Bible isn’t nearly as clear as we are. If you look at the idea of image in light of ancient near-Eastern culture and linguistics, however, you find something fascinating. It turns out that Egyptian and Mesopotamian kings were very fond of setting up statues or images of themselves in conquered lands where they were physically absent. So the idea of being in the image of something had more to do with being a representative of someone. You might think of it as being an ambassador. Being imprinted with someone’s image says something vital about whom you are meant to serve. If we want a clarifying question with regards to our allegiance, we must inquire, “Whom am I intended to serve, and what is my purpose here”? Honestly, with all of our competing allegiances, this is not a simple equation whatsoever. Indeed, if I were to make a list of the ways in which I could identify myself, it might fill the page. Maybe that would be a good exercise for all of us to do right now. Because you need to understand that all of these entities are making a claim on you. They want you to serve them, and have subtle ways of creeping in and making it happen. Affiliations accumulate allegiance. But you were created in God’s image, and so your identity and purpose is to represent God. Your mandate is to be an ambassador—not for the Republican Party or the Radmacher family or the megachurch on the corner—but for God. The great danger is not that we will render too much to God, but to Caesar. Ask yourself—what entities usurp my kingdom allegiance? What would it look like to live into the image of God? 1) Wholeness of character. If you belong to God’s kingdom, then it means that that dominion is over your entire life. It isn’t a room that you retreat to on Sunday with holy conduct, and then live the rest of the week in another kingdom and by its skewed moral norms. That is divided character. If your purpose is to represent the King of all the universe while residing in this earthly kingdom, then your behavior has to reflect His character, values, and priorities, even when it is inconvenient. It means that you cannot adopt the methods of this kingdom, regardless of the power it achieves for you. You can’t love your neighbor in one kingdom and savage him on Twitter in another. You can’t demand integrity from one politician yet look the other way with another. You can’t support a president who verbally assassinates his foes and repeatedly lies, yet pretend that you are somehow furthering God’s kingdom by doing so. You aren’t. You must have wholeness of character. 2) Singularity of purpose. If you belong to God’s kingdom, then your purpose in this earthly kingdom is singular and other-worldly. It is God’s purpose here. You are, after all, God’s representative. Throughout history, God has allowed evil and corrupt rulers and governments for a period of time, and under those conditions, it is difficult not to make your sole purpose in life to defeat them. Rome was one of the worst imaginable. And yet, Jesus said “if my kingdom were of this world, my servants would fight.” We know that someday the kingdom of this world is going to become the kingdom of our Lord. How will that happen? Not by overthrowing one corrupt regime after another—that has been God’s project throughout history. Instead, it comes from people like you and me understanding their true allegiance and giving themselves to the kingdom of God wholly and devotedly. Render to God the things of God in your life, and the kingdom of our Lord comes.